Lativa had a dramatical debut in 2000 when the Britpop group Brainstrom came 3rd in Stockholm. Two years later Marie N could bring the Eurovision crown to Latvia with “I wanna”. The Latvians hosted a superb contest in the beautiful city of Riga. It’s impressive that some new countries can win immediately and other countries, which participate since the early ages never won or even get close to it, like Portugal. Latvia has send excellent entries to Eurovision so far, remember “The war is not over” from Walter & Kazha, or last year’s entry “Questa Notte” by bonaparte.lv. Europe was looking to Latvia and said “wow – that’s great”. But this year, it changes dramatically! The Latvian song “Wolves of the Sea” is a cheap carnival beer tent song, only bearable when you are drunk and you cannot count until three anymore! 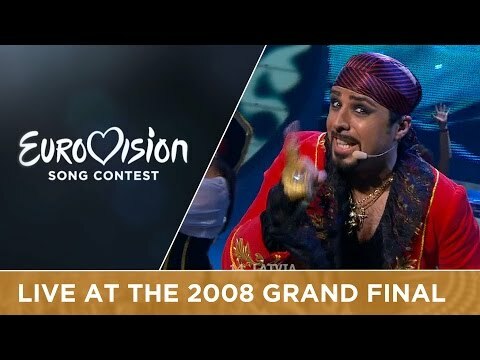 How could the Latvian chose such a sleazy “Pirates of the Caribbean” version for Eurovision? Didn’t they learn that such gimmick songs only succeed if they are very good? With these kind of fun-entries the reputation of the Eurovision will be destroyed in a heavy way. The reviewers will lung for something like this and announce the Eurovision Song Contest as worthless, just bring low quality songs, not a musical pretension. This is a 0 point candidate!